With the rapid world-wide growth in wind energy installations, the number of people working in the field is increasing correspondingly. According to the International Renewable Energy Agency (2016), 1.1 million people were employed directly or indirectly in the wind energy industry world-wide in 2016. Whilst a number of wind energy degree programmes have been introduced in some countries (for example a Master’s degree at the University of Applied Sciences Bremerhaven, the University of Hannover and the University of Oldenburg in Germany, at the University of Strathclyde in the UK and at the Danish Technical University in Denmark as well as the European Wind Energy Master), the majority of people working in the wind energy industry have little or no formal education or training relating to wind energy technology. Whilst I strongly agree that on-the-job learning is very valuable, there are nevertheless certain technical concepts, which, if understood properly, can greatly improve performance of employees in the business environment. Understanding wind energy technology not only allows you to negotiate more credibly, present yourself more competently and persuade stake-holders of products or investment ideas - it also helps you to form independent, informed decisions, to evaluate the threats and opportunities of a situation better and to assess state-of-the art technology. There is a key physical limit to the performance of a wind turbine. It is important to know and understand this limit in order to be able to quickly and competently react to situations relating to wind turbine performance. If presented with a power curve or with a rough number regarding efficiency, for example, you may want to be able to establish quickly if this is realistic or not. This physical limit is known as the Betz Limit and tells us the maximum amount of power that can be produced by a wind turbine rotor as a ratio of the amount of power available in the wind. The Betz Limit is obtained by imagining the best possible, most ideal way of extracting power from the wind. This is done by assuming that the wind approaches the rotor in a nice, well-behaved, streamlined manner (see the upper diagram in the figure below). The rotor is assumed to be a flat disk-shaped object that does not have any aerodynamic, frictional or rotational losses. It is porous and allows some of the wind to flow directly through it. The rest is forced around it. The wind flowing around and behind the rotor is also assumed to be nice and streamlined. On the figure, position 0 describes the incoming wind, position 1 describes the wind at the rotor plane and position 2 describes the wind at a location slightly downstream of the rotor. We’ll use this numbering later. In order to understand the Betz Limit, we shall now look at these three things in more detail. As the wind flows around the rotor, the streamlines are forced apart. This reduces their speed due to the law of mass conservation. This law tells us that, in a closed system, the mass flow rate remains constant. This is because the mass does not have anywhere to “escape” to. The mass flow rate of a fluid is defined as the flow of mass per unit time (kg/s). This is calculated by multiplying the fluid density (kg/m^3) with the cross-sectional area of the flow (m^2) and the flow speed (m/s). If we just consider incompressible fluids, increasing the flow area therefore forces the flow speed to reduce by the same amount in order to maintain a constant mass flow rate. This principle works the other way round, of course – think of a pipe with water flowing through it. If the pipe gets narrower, the water flows faster. The water is incompressible and has got nowhere else to go, so must speed up. You probably also noticed that the streamlines on the diagram start to bend apart even before they reach the rotor and that they continue to bend after they pass the rotor. This means that the wind speed already starts reducing before it reaches the rotor, and continues to reduce afterwards. At some point not far downstream of the rotor, the minimum wind speed is reached. Further away, the wind speed increases back to the original value. This occurs by about ten rotor diameters downstream of the rotor. These changes in wind speed can be seen on the middle diagram on the figure above. The amount of wind speed reduction at the rotor plane is important for assessing the performance of the rotor, as this then dictates the rotor aerodynamics (which we shall discuss in part 2). This is quantified using the induction factor, which is defined as the difference between the undisturbed wind speed and the wind speed at the rotor plane, divided by the undisturbed wind speed. So if, for example, the wind speed is reduced from 10 m/s to 6 m/s, the induction factor is equal to 0.4. It’s quite easy to imagine that the wind flowing around the rotor exerts a horizontal force on it in the flow direction, caused by the fluid pressure. Pressure is defined as the force per unit area (N/m^2 or Pascals) and contains two components – static and dynamic pressure. The static pressure is exerted by the movement of particles within the wind even when it is not moving and the dynamic pressure is exerted by the wind movement. The moving fluid possesses momentum, which is defined as its mass (kg) multiplied by its speed (m/s). As already mentioned, the presence of the rotor decreases the speed, and therefore also the momentum, of the wind. It is this change in momentum that exerts a force on the rotor, leading to a discontinuous pressure drop over the rotor. Newton’s 2nd law states that “The vector sum of the forces on an object is equal to the mass of that object multiplied by the acceleration of the object”. As the acceleration is defined as the change in speed with time, the sum of the forces is thus equal to its change in momentum with time. The force acting on the rotor can therefore be established by subtracting the total momentum of the wind at position 2 from the total momentum of the wind at position 0. As well as having a constant mass flow rate, our wind turbine system also has a constant amount of energy. According to the 1st law of thermodynamics, energy cannot be created or destroyed, only converted. This means that a closed system must have a constant amount of energy. So if we define the diagram in the figure above as a closed system, we can say that the energy going into the system is equal to the energy going out. As the wind speed at position 2 is lower than at position 0, it possesses less kinetic energy. This difference must therefore be equal to the energy transferred to the rotor (assuming no losses). We can quantify this amount of energy using Bernoulli’s law, which is just the law of conservation of energy applied to ideal fluid flow. If the flow remains more or less horizontal as in the case of our idealised rotor, the law states that the sum of the static and dynamic pressure of the flow remains constant. However, this only applies for streamlined flow, and therefore cannot be applied for flow through the rotor. Therefore the law can be applied to quantify the decrease in dynamic pressure and thus the increase in static pressure due to the decrease in wind speed from position 0 to position 1 and from position 1 to position 2, as can be seen on the lower picture in the figure above. As mentioned in the previous section, there is a discontinuous pressure drop over the rotor caused by the thrust force acting on it. The ratio of power that can be produced to the power that is available in the wind is generally known as the power coefficient, Cp. The Betz Limit can thus be quantified by calculating the maximum possible power coefficient. This is done by combining the results of the analyses in the previous three steps to obtain the maximum amount of power production and dividing this by the amount of power available in the wind. 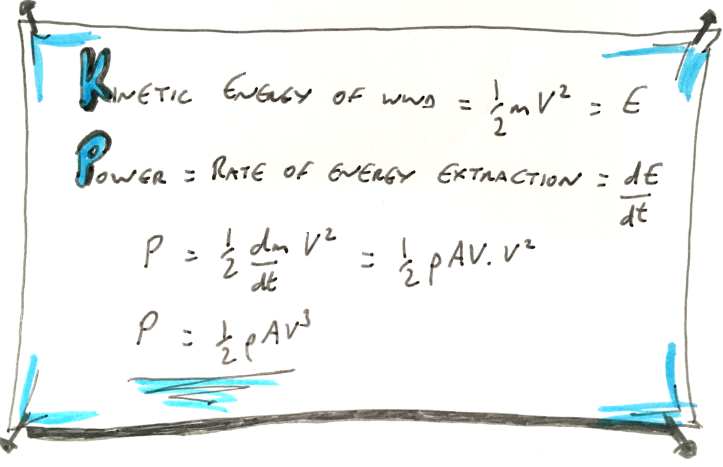 The power available in the wind is just given by the rate at which the kinetic energy can be extracted and is proportional to the wind speed cubed as shown below. The result is then an expression for Cp that is dependent on the induction factor of the rotor, as shown in the figure below. You can see that the Cp has a maximum value of 16/27 (approx. 0.59) at an induction factor of 1/3. This means that an ideal rotor reduces the wind speed to 2/3 of its original value at the rotor plane, extracting almost 60% of the energy of the wind. A wind turbine rotor should be designed in order to get as near as possible to this ideal induction factor. In reality, the wind flow is not two-dimensional, streamlined and frictionless as assumed here, nor is the rotor loss-free. Therefore the actual Cp of a real wind turbine rotor is always lower than this maximum value. Today’s modern rotors reach a maximum Cp of up to about 0.5. Check out part 2 to read all about tip speed ratio and the optimum power coefficient – coming soon!